The Wall Street Journal tells the story of a peer-reviewed study that measured the impact of different messages designed to convince residents of one Californian town to, of all things, switch to using fans instead of air conditioning to beat the heat. Studies also show that a majority of us look at product reviews before making a purchase, and that we are more likely to buy from websites that incorporate product ratings and reviews. In the age of the empowered Internet consumer, these considerations loom ever larger and reviews and ratings play an increasing role in driving consumer behaviour – particularly in areas where the purchase decision requires a high investment of time and money, such as travel or study abroad, or where there is an overabundance of relatively undifferentiated products, such as mobile apps, music, or books. Student or alumni testimonials are a key type of social proof in recruitment marketing. However, as we reported in an earlier post, many institutions make only limited use of testimonials in their web content. And institutions and schools would no doubt find that this is an area where they could go further: to include testimonials more extensively in key landing and conversion pages, for example, or to incorporate photos or videos. 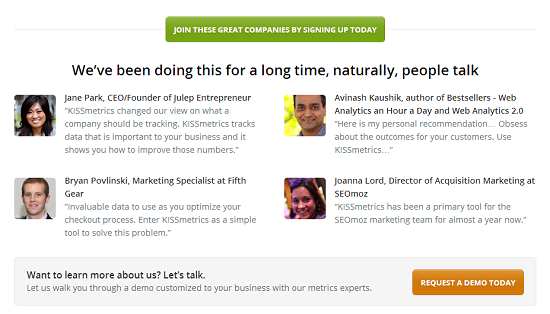 Consider the following conversion page from the analytics firm KISSmetrics. This is a strikingly clear illustration as to what a powerful lever testimonials can be when placed alongside an invitation to sign up, inquire, apply, or buy. As this example might suggest, having a strong call to action that encourages prospective students to inquire for more information about your school or institution is one thing; pairing it with first-hand alumni comments about how your ESL programme developed their language skills and helped them succeed in graduate school is something else again. Higher Education Marketing points out that social proof comes in other forms as well. Social sharing indicators that illustrate how often a page or item has been liked or passed along via social networks are one such example. 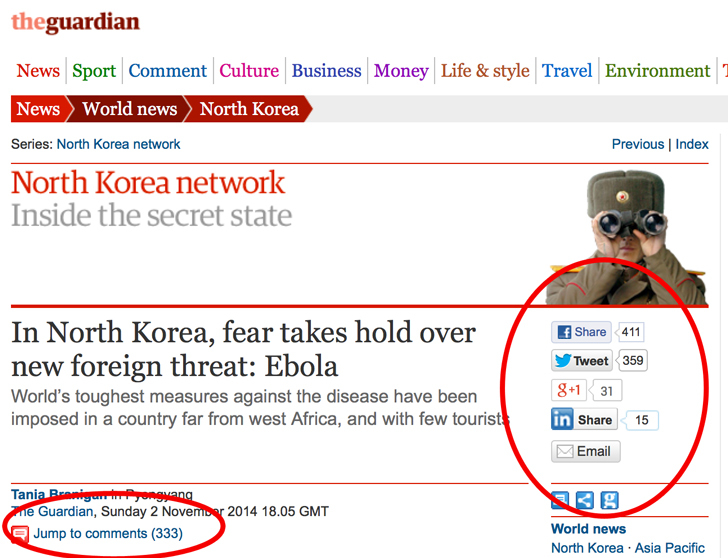 You can see examples of such indicators highlighted in the screen capture from The Guardian newspaper below. The Visual Website Optimizer blog has an important caution about using such social sharing cues, however, pointing out that low numbers of “likes” or shares can represent a negative social proof – that is, they can make the page seem unpopular or lightly visited. As such, these indicators need to be used with caution, and perhaps selectively, to ensure that they are providing the kind of positive social cues that you intend. Higher Education Marketing highlights two other types of social proof in their report: rankings and awards, and trust icons. Rankings and awards are a time-tested means for establishing social proof of the school or institution’s reputation and standing. 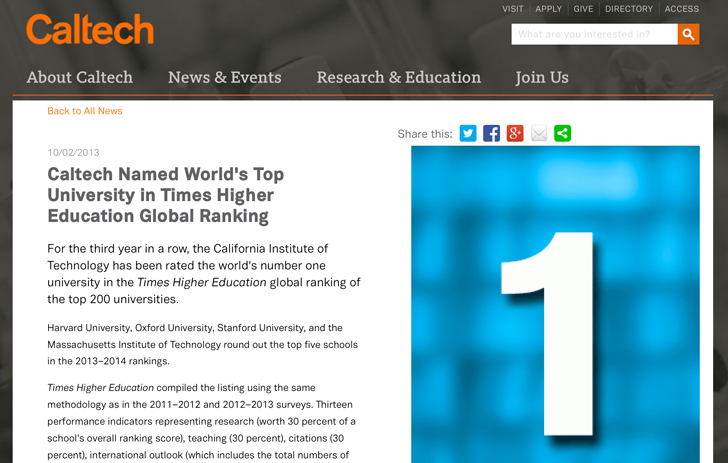 However, if you do make a prominent mention of either in your web content, take care to provide a direct link to details of the ranking table or award programme to provide further confirmation of your proof point, as in the Caltech example below. Trust icons – visual cues of a formal certification or accreditation – have something in common with rankings and awards in that they also provide an external indicator of the institution or school’s bona fides and quality. These might range from a security verification for secure e-commerce services to an indication of a formal accreditation or industry certification. The example below (from Higher Education Marketing) shows two complementary approaches to incorporating trust indicators as social proof. In an insightful post on the KISSmetrics blog, Gregory Ciotti provides two additional best practices to apply when incorporating social proof points in your recruitment messaging. First, focus on your prospect personas and feature social proof elements that reflect those key prospect attributes. Stories, personas, external indicators, social signals, and testimonials – these are the building blocks of establishing and reinforcing social proof, and of a promising and high impact messaging strategy for international recruiters. They form a strategic approach to messaging, and web content in particular, that appears to be widely underused in education marketing and as such, represents an important source of differentiation (not to mention improved conversions for inquiries and applications) for many institutions and schools. This entry was posted in Africa, Asia, Australia/Oceania, Europe, Marketing, Middle East, Most Popular, North America, Regions, South & Central America and tagged alumni recruitment, language schools, backpackers marketing, tertiary education overseas, education abroad. More online degrees on the horizon?